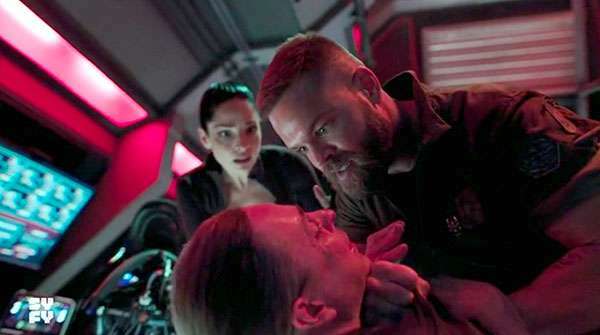 This week we discuss season 3 of The Expanse with the ninth episode titled “Intransigence”. If you would like to preorder season 3 of The Expanse on DVD or Blue-ray you can purchase them via Amazon. USA or Canada. The episode opens on the Behemoth as they’re trying to repair the ship after several systems failed after firing their missile. Naomi finds herself in a difficult position. She’s upset over the recent actions taken by Ashford and Drummer and Ashford chastises her for not pulling her weight as chief engineer while worrying about the fate of the Rocinante. Drummer attempts to apologize but Naomi walks away. Ashford later informs Naomi that her former crew is still alive. They don’t know any more than that so they plan on entering the Ring to get more answers. He sais her admires her loyalty to her old crew but it’s just nostalgia she’s feeling. She left her old crew for a reason, she’s a Belter and she belongs with Belters. As the Behemoth is about to enter the Ring, Drummer addresses her crew and gives very motivational speech reminding them that they are Belters, they are strong and it is their right to claim their part of the Ring. Once inside the bubble, Naomi tries to steal a skiff but she’s caught by Drummer. She tells the captain that it was a mistake returning. Her place is on board the Roci. Drummer is upset that Naomi is leaving her but she understands and allows her to leave. On board the Roci the crew is trying to make heads or tails of their predicament inside the Ring. They deduce that there’s a speed limit inside the mysterious bubble of space and anything that goes too fast within it gets snapped up and taken towards an unknown object in the center of the bubble. While discussing the crippled state of the Roci, Amos comes to the conclusion that Cohen is responsible for the systems failures. The cameraman confesses when confronted but he doesn’t know what he did or who hired him to do it. A Martian ship, The Shousen enters the Ring and starts testing the limitations of their new environment, complicating matters for the Rocinante. They determine the maximum velocity they can travel and they fire a probe at the bubble wall that simply vanishes upon touching it. Holden reveals to the crew that he’s been seeing visions of Miller who has been cryptically helping him but not since they’ve entered the Ring. He retires to his stateroom to try and contact the detective but Miller isn’t cooperating. Amos meanwhile tries to no avail to get more information out of Cohen. He even threatens to kill Monica if the cameraman doesn’t cooperate. Alex interrupts them as Amos locks Monica and Cohen in an airlock. The mechanic calmly explains that since their com system isn’t working, it only makes sense to space the two in the hopes the Martian ship picks them up. After all, the MCRN isn’t after the documentary crew. And if they make it, they can deliver the message that Holden is being framed. On their own, Jim, Alex and Amos are in deep. They can’t fix the ship and they’re running out of options. 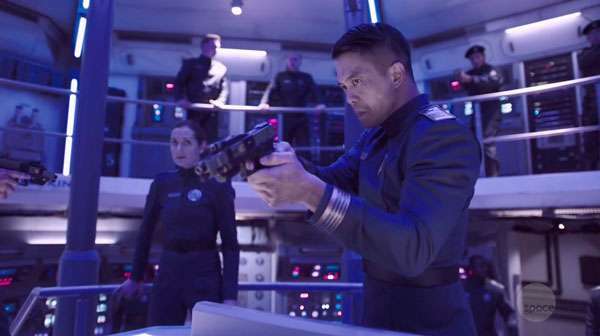 Holden decides their best course of action is to surrender to the MCRN and hope that Monica was able to convince them of the truth. They’ll lose the Roci but at least they’ll survive. Miller finally shows up after Holden has accepted his fate. The detective tells him they have to go to the nucleus, the station at the center of the Bubble. Only there will they find the answers they’re looking for. So Jim suits up and heads out. On the Thomas Prince, in lieu of recent occurrences, all civilians are being ordered to transfer ships for a return trip home. Anna and Rev. Cortez are discussing their disappointment at coming so close and now having to leave when they find out the ageing debutant Tilly has a way to bypass the rules and stay on board. Anna quickly asks the woman to help her do the same. When Anna offers Rev. Cortez a chance to stay as well, he shows his fear and turns down her offer. Sitting nearby, Melba recognizes Tilly’s laugh and it triggers a memory from her past. We find out that Melba is actually Jules-Pierre Mao’s daughter and sister to Julie Mao. Julie, the apple of her father’s eye who never appreciated the life she had like Melba did. At a party in her honour, Julie tells her father that she’s quitting the racing team and heading off to the Belt. When he chides her she tells him off, telling him that she can’t stand being a part of all the corrupt things he’s doing. When Melba tries to console her father and offers to take Julie’s place on the racing team he tells her that’s absurd and brushes her off. Melba later confronts Julie about her actions. She tells her older sister that she’s through being humiliated by her. Before walking away, Julie tells Melba that their father is a damaged man and that she’ll never be good enough for him. Later, with her father, Jules-Pierre Mao confesses to Melba how much more he admires Julie than de does her. Back in the present, Melba isn’t happy with the way her coworkers are treating Ren’s demise. She’s obviously upset over his death. Upon hearing the news that Holden is still alive she decides to stay on board the Thomas Prince to finish what she started. She sends a message to her father telling him that she’s going to do for him what Julie never could. Destroy the man who brought him down.